I took a Monday off for time in lieu and went early morning with dad. The weather was beautiful albeit quite windy. There was a bit of splashing about to suggest a few fish were about. 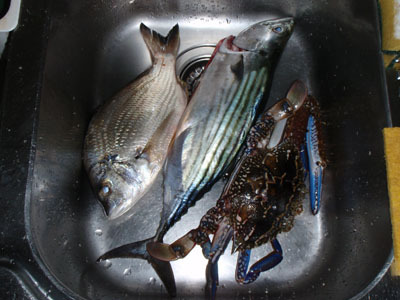 We fish for a few hours without much luck, until we hit the familiar dead weight of a crab. 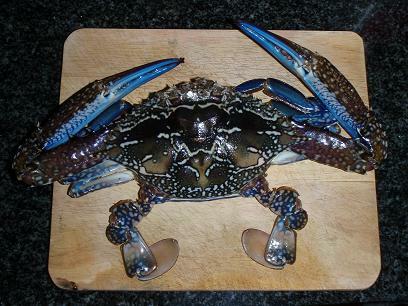 It turned out to be quite a big dinner sized crab! After that, we were on again, with the usual bumps on a snapper or bream. It was confirmed as a keeper bream measuring near 30cm! I then saw some splashing near the shallow water and quickly went over with a live bait. Dropped it near by and felt the hit. It then took off like a rocket! But was only a short burst. I sensed it was a bonito and was proven right after a 3 minute fight. Great fight on a small rod! It measured about 45cm. Beautiful weather for fishing, the water was clear, and not much wind about. The baitfish were surprisingly easy to catch, suggesting that there probably weren’t many big fish about. Our thoughts were proven correct judging by the number of crabs that were hitting our baits, but none were hooking up. Eventually after a few hours, we were able to bring up a crab after it got itself tangled in our line. Towards the end of the day, we had a few squid hit the bait which we were able to catch after swapping with a squid jig as it let go of the baitfish. The weather was warming up to true summer conditions at around 26 degrees. It was windy but still fishable. We managed quite a few yellowtail and squid in quick succession. The squid were a bit all over the place, having to cast far and wide to get them. We decided to try our luck with some yellowtail fillets and squid strips. One of the rods went off in short bursts, followed by a dead weight when winding it up, the same idiosyncrasies usually shown by flathead or sting rays. On further inspection, it was quite a large flathead and since only having 9lb line on as lead, we decided to beach it. It measured 65cm. Apologies for the picture quality, we decided to subdue the fish to put it out of its misery. One of the other fillets managed yet another crab! They seem to be in season of late. Perfect day for fishing and was also matched by the abundance of bait fish, primarily yellowtail. Put a few fillets out there to try our luck. We were indeed lucky to hook up two by-catch large blue swimmers! Both had become entangled with the trace around the hind legs. A more proper way to catch them would be to throw out what we would call a “bird’s nest” or just some tangled monofilament line and toss that out with some bait in the middle. 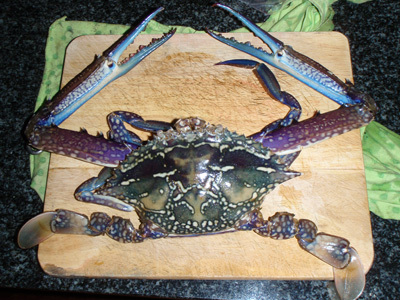 The crab will then proceed to have a go at it and get tangled itself with the line. Of course, putting a bird’s nest out does not give you a chance to catch a fish with that bait. I headed to down to Port Hacking just before brekky yesterday, there was a touch of a breeze but overall it was an ideal day for fishing. The action was mysteriously slow for what would be considered perfect conditions. I used half of the squid that we caught on our previous trip as bait by lunch in hope for something significant. The squid attracted a horde of juvenile snapper, but nothing to write home about! The other half of the squid was greeted with the familiar rocking of a blue swimmer. As I slowly wound it up I saw what was by far the biggest blue swimmer I had seen! The crab slipped off the bait but fortunately got tangled in the line of my dad’s rod right next to it and I was able to bring it up. The blue swimmer measured approximately 25cm across the shell. 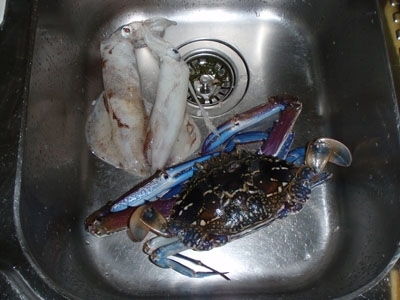 I kept the blue swimmer and took it home for a steamed crab dinner.